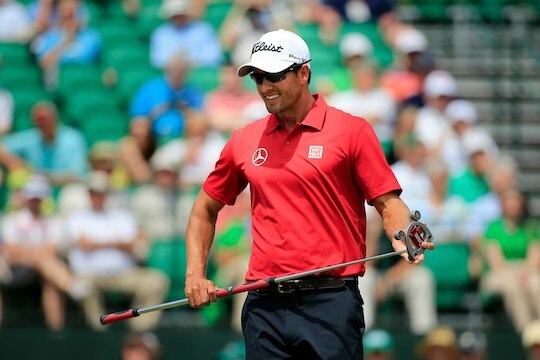 It is a case of Queensland continuing to rule this year’s PGA Tour with John Senden and defending Masters champion Adam Scott inside the top-three heading to the third round at Augusta National. Senden, and winner of the recent Valspar Championship, posted six birdies in a round of 68 to move into second place at four under par and just three behind former Masters champion Bubba Watson. The 2012 Augusta winning hero birdied five holes in succession from his 12th, and despite dropping a shot at the last, his round of 68 was good enough for a seven under par 36-hole leading tally. But while Watson looks to be fitted with a second green jacket history is against the Bagdad-born player who has led eight times before after the opening two rounds of a PGA Tour counting event, but only managed to close out one and that being 2011 Zurich Classic of New Orleans. Senden and Scott find themselves on back-to-back pages in the official 2014 Masters Players Guide but with the 42-year Senden ending the round just one ahead of the fellow Queenslander. Senden’s opening 36-hole effort is easily his best in twelve prior Masters showings including when he was lying seventh after two days a year ago. “Yeah, I am. I’m excited to keep doing what I’ve been doing, playing good golf,” said Senden. And after the confidence boost of his recent victory at Tampa Bay, and Senden’s second on the PGA Tour, Senden is quietly confident of achieving what a year ago was totally unimaginable, and that is becoming the second Australian to be fitted with an Augusta National members green jacket. “All I can do is stick to the game plan, and that’s doing my job well,” he said. And while Senden emerged as a possible new Masters champion Scott kept alive his hope of becoming only the fifth player in Masters history to successfully defend at Augusta National. Scott was in trouble up the final fairway and was observed in deep conversation with is caddy Steve Williams after his tee shot at 18 veered into the trees. However with the comfort from Williams ‘If you can get a club on it, then go with the 7-iron’. Scott put his second into a greenside bunker but managed to get up-and-down for par.